What Is Your Social Media Motivation? People are all salesmen in today’s world. It’s apparent in all social mediums – Facebook, Twitter, Instagram – that overlooked post of someone trying to sell a product that gets glossed over by people browsing through their feeds. They want their products sold, their websites to be visited, and their gigs to be attended. These advertisements are commonplace, unnoticed and not talked about. The most common ads, however, are not made by corporations or celebrities. They are made by the common, everyday person, with their social media connections being the target clientele. Like Madison, millions of lives are on display via social media, the stars of their own reality show. Even the most ordinary of lives are now glamorized and elevated through photos – moments in time that are sensationalized through captions. Whether they realize it or not, people are selling the idea that their lives are fabulous and desirable. Why is there this burning desire to sell an image? Why are Millennials consumed with their own celebrity? These motivations can be better understood by thinking about the audience, which can be split into three groups – 1) people that are already part of one’s social circle outside of social media, 2) people that were once part of one’s social circle but are no longer, and 3) people that one is trying to get the attention of. Every photo, every caption, and every status update is on display for every Facebook friend, Instagram follower, and Twitter follower. Do people seek validation of their elevated status in the form of likes? 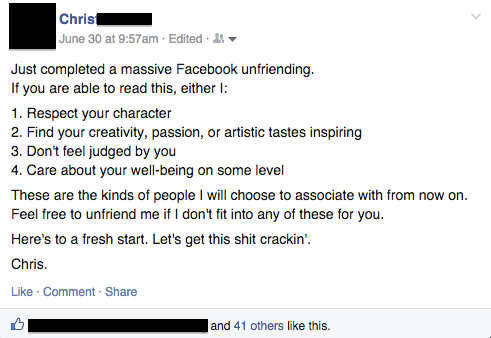 Do people genuinely want their friends to share in their successes and failures? Is a photo or an inspirational quote meant to sell an image of someone the poster wants to be, but isn’t? These questions highlight a great struggle for the Millennial generation. It’s the identity crisis that is being played out on a cyber scale. Do character and value dictate one’s social media, or does one’s social media dictate character and value? Only the individual knows his or her own motivations. But this social media motivation is a discussion that is worth having – who knows how many people are out there just like Madison?